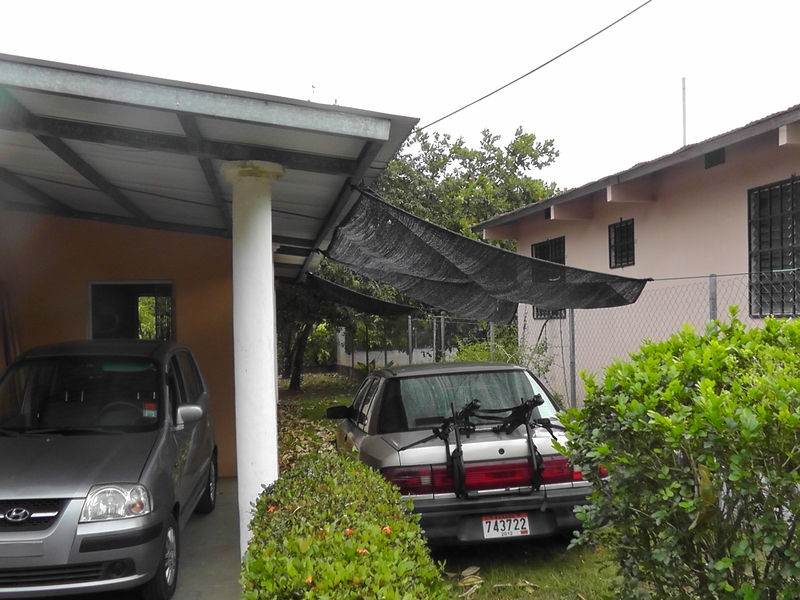 David, Panama is known to be hot and our little Hyundai Atos doesn’t have the best AC.Our carport doesn’t have enough overhang to keep the sun off the side so I decided to add some shade. Gregorio, our Panamanian friend had some material he called saran shading the front of his house and told us he would go with us to get some if we wanted. So, off we went in search of saran. Four places later, we found it. It cost $4 a linear meter and was 12 wide. I bought 5 meters for $20 and had 2 pieces about 16’x6′, one for the side of the garage and one for the patio in back of the garage. I went to the Do It Center but saw that the rope I was after was pretty expensive PLUS the single cashier had a line with 20 people in it-I left empty handed. On the way home I remembered that I’d brought a lot of microphone cables that weren’t in use and could take the place of the ropes I had wanted to buy. Getting it hooked up was pretty easy. The roof is corrugated so the ends of the mic cords fit through and were tied then stretched diagonally and tied to the chain link fence. 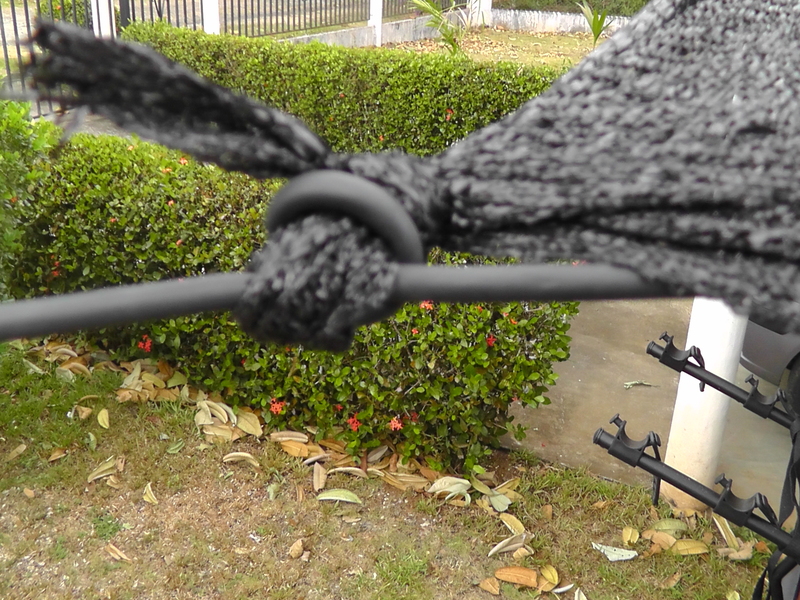 The saran can be twirled and tied in a knot and fastened to the mic cords. 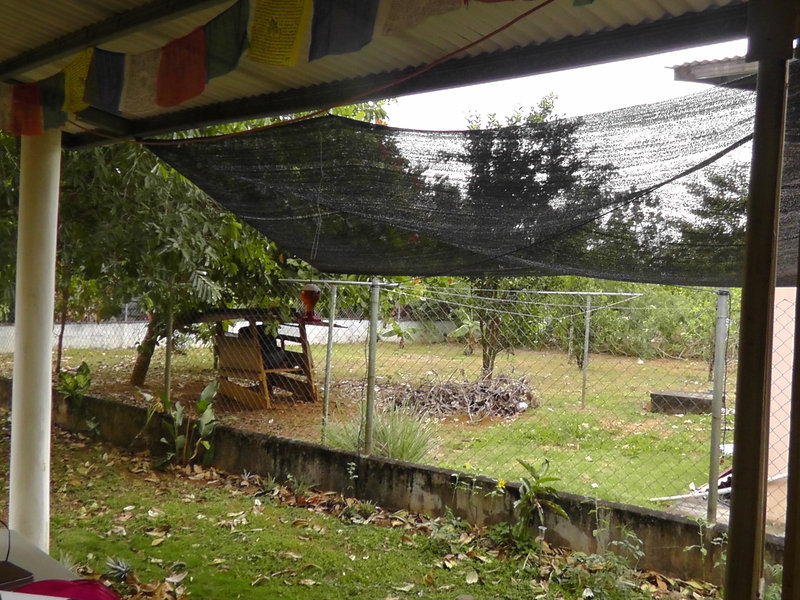 I’ll probably get more wire ties to support the saran closest to the house. There it is. Cheap, easy to install and now we have a cooler car and a lot more shade! Posted on February 3, 2013 by joeltc1. This entry was posted in Uncategorized. Bookmark the permalink. What kind of noise does the stuff make with a breeze. Anything like those blue tarps? When it’s breezy I hear the leaves on the roof but the Saran seems to be silent. I’ll pay more attention and let you know if there actually is any noise from it. Well, where did you buy the Saran? Four places later is at where? Does it let the aid through. 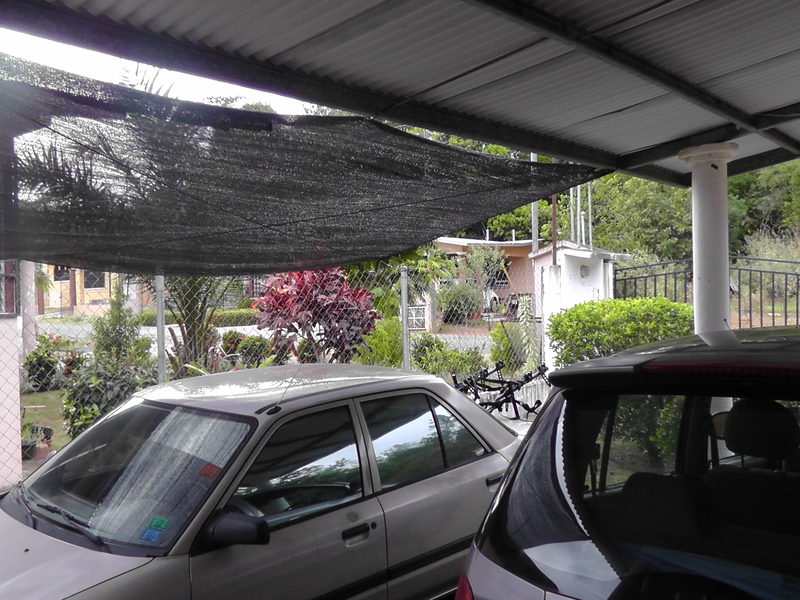 It looks like it might be ideal for my garage to slow the breeze that occurs now. Scroll down on this page and there is a picture of it, dark green store. I’m not sure if I can explain how to get to the store though. It’s downtown in the older part of downtown, sort of near the bus terminal, very near the very congested area with all the street vendors, across from a large empty lot (if my memory is right, which doesn’t always happen). The store seems well known for all sorts of agriculture things so people should be able to point you in the right direction. Or if you’re stuck, write me back and I can meet you downtown sometime. They sell the saran by the meter and only had black when we were there, but it has helped enormously in keeping our patio cooler. Thanks, I believe that I have an idea where the location is. Well, I should have asked my Panamanian wife about the saran. Seems it’s purpose is to cover seedlings when potted from the sun. It is sold in Melo’s.